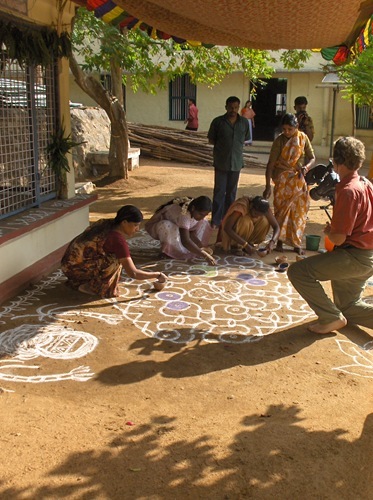 Pongal is a BIG holiday and celebration in Tamil Nadu, spanning four days (January 13 – 16 in 2009). It seems to be a combination of harvest festival and New Year. It’s a time of renewals and new starts. 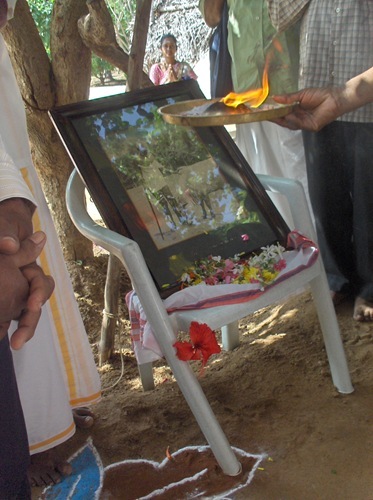 Following the traditions, people will, the day before Pongal, collect and burn old items, like clothes. 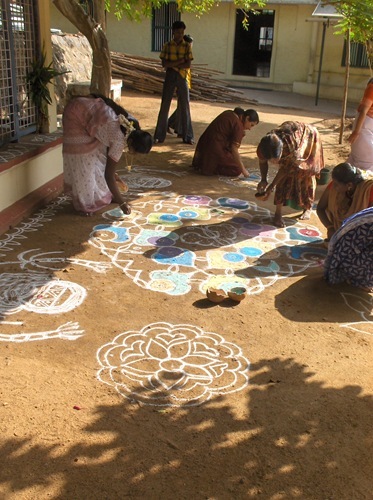 On the first day of Pongal, elaborate kolams (rice flower drawings) are made by the women on the street in front of their doorways. 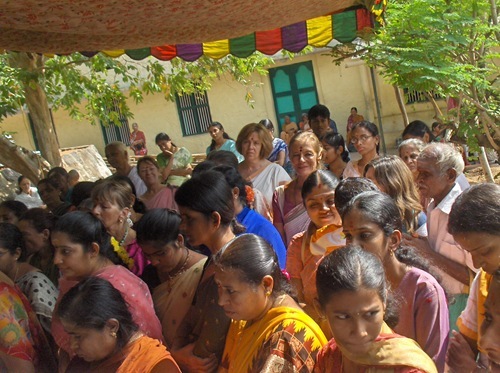 Families gift each member with new clothes. The next day a special breakfast is prepared and eaten. This includes new rice and this morning’s milk. One image of Pongal is of milk boiling over in a cooking pot. 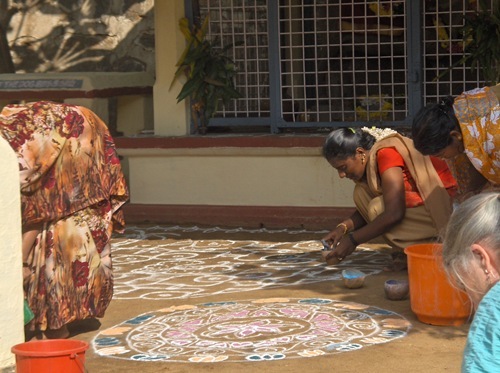 One sees this image again and again in the kolams, along with images of sugar cane stalks. 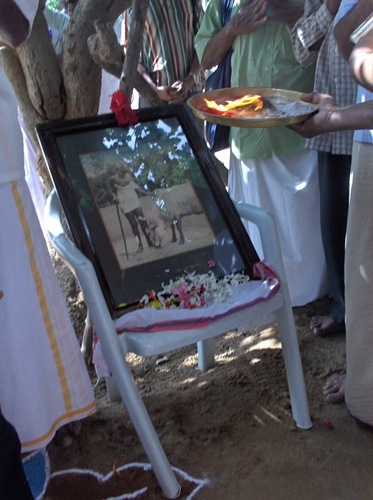 The third day is ‘Cow Pongal,’ celebrating cows, which are seen as very holy here (a friend once told us that cows contained ‘one million gods’), and as real life givers to the people, providing milk for ghee and curd, and manure for fuel for the stove (and to use to clean floors). 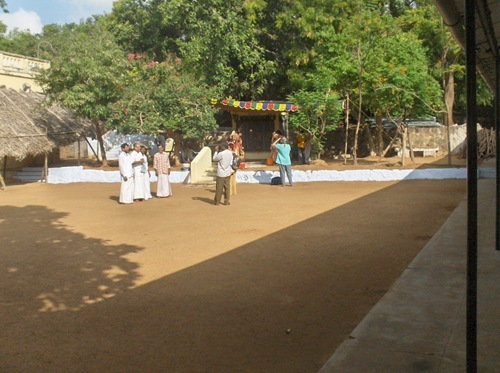 Our activities on Cow Pongal day are shown here. 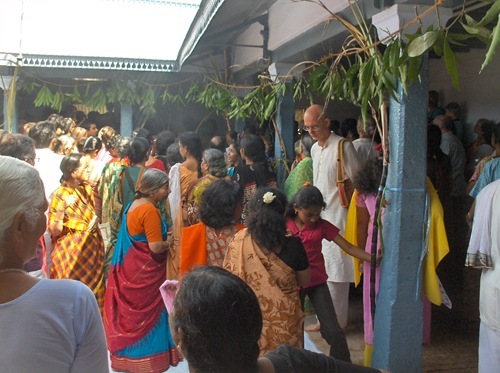 The celebrations at Sri Ramanasramam are featured. My day started early, when I walked over to Arunachala. 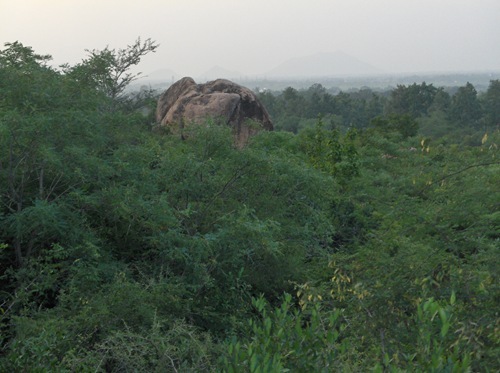 I climbed a small bit onto the side of Parvati Hill, at the west end of Arunachala. The photo below shows that forest here, which is pretty dense. 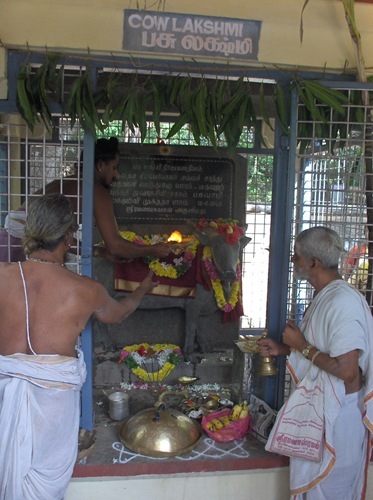 When I returned home, it was time to go to Ramanasramam. Things were starting to happen for the day. 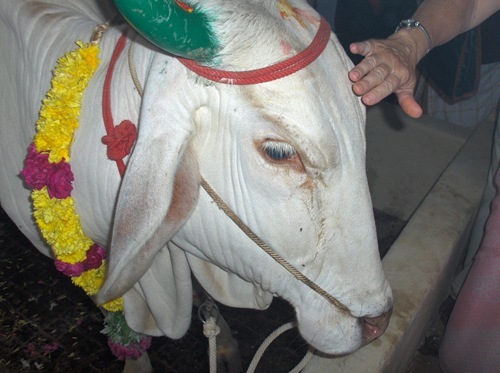 When we arrived at the ashram, people were preparing the samadhi of Laxshmi the cow. 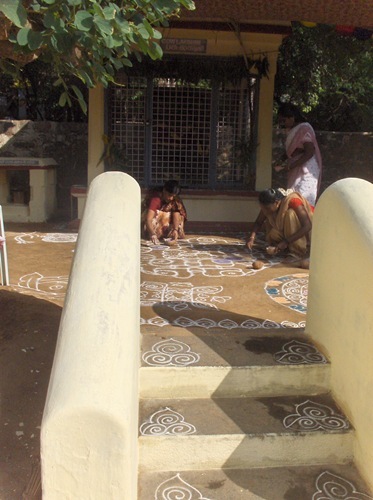 Several women were working on kolams to decorate the samadhi. Since it is a special day, color is being added to the design. Meanwhile over at the cow shed, not much seems to be happening yet. 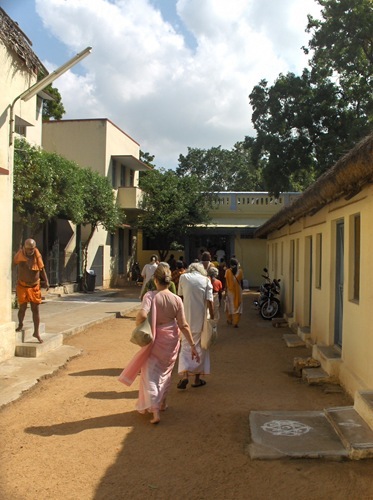 We head into the hall that surrounds Ramana’s samadhi. A puja is underway here as people stand and watch. 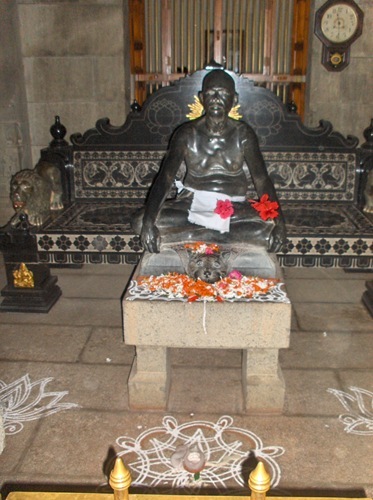 The decoration of Ramana’s samadhi is almost complete. Now it is blessed with a camphor flame. 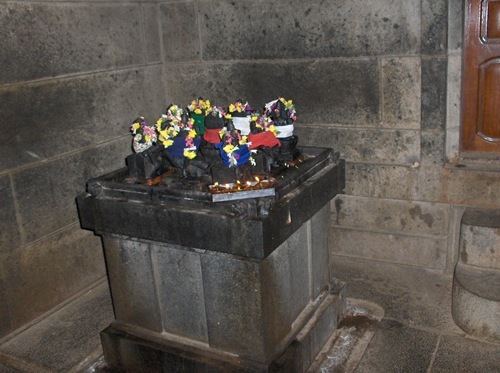 Then this flame is carried out into the assembled crowd so that they can bless themselves from the flame, and put vibhuti and kum kum on their foreheads. 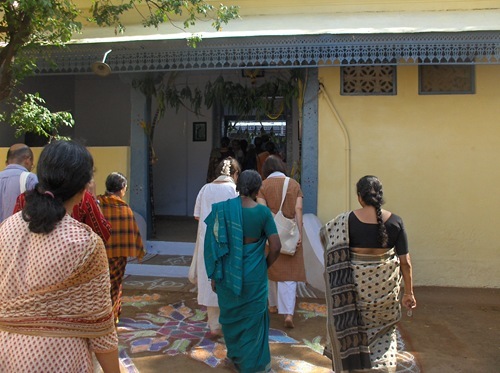 We then went into the Mother’s Samadhi. We heard that something special was going on in here. 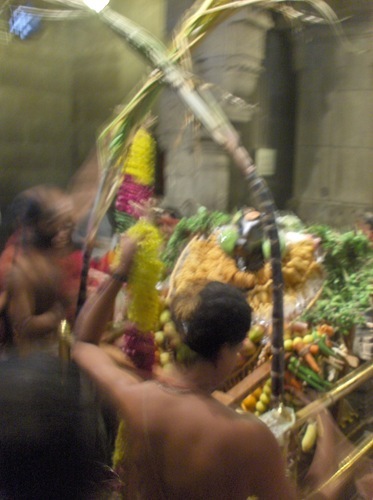 As we walked to the front of the Nandi, we could see much decoration for today. This decoration was still going on when we arrived. 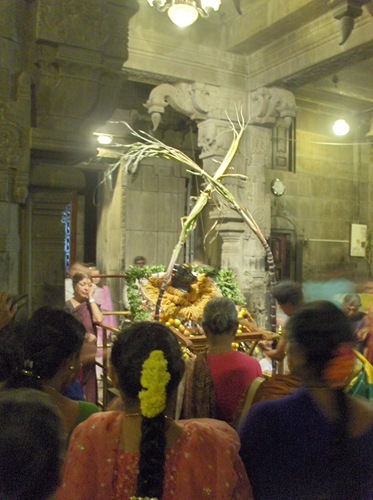 Since it is Pongal, sugarcane stalks are an important element in the decoration. The priest adds more fruit to the decoration. Then a big flower mala is added. 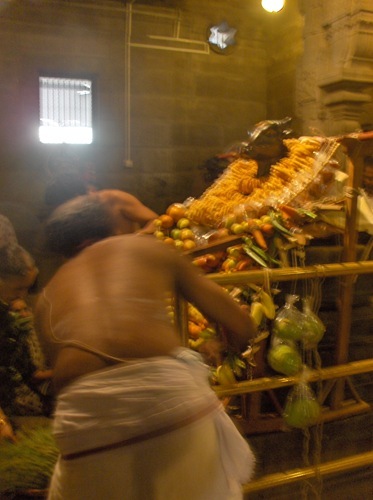 Now one of the priests is decorating the head of the Nandi with turmeric, accenting the eyes and other features of the head. 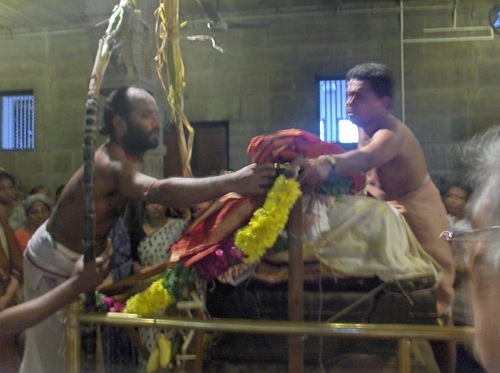 The last step is to dress the Nandi. 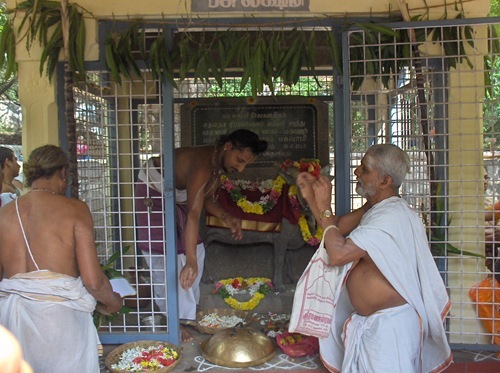 Two priests work together to put on the red dhoti. 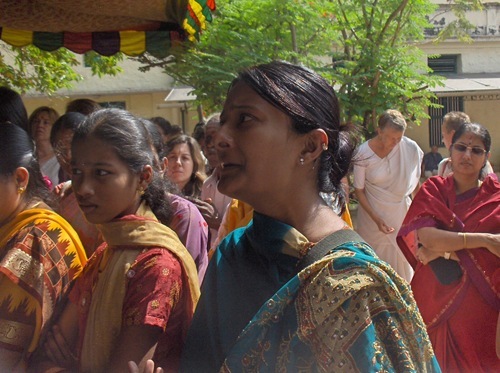 Then several women sing a Tamil song. The sense of devotion and excitement is high. 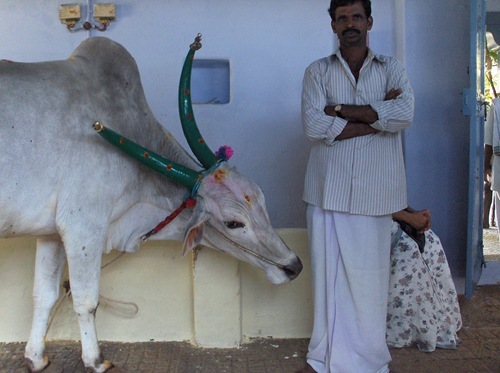 Here is Nandi, completely decked out for Cow Pongal. In this closeup below, the turmeric decoration of the head can be seen. 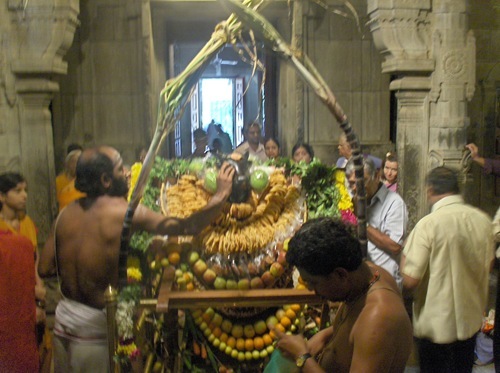 Around its neck, in addition to the garlands of bananas, ladyfingers (okra), carrots, and several other fruits, are three garlands of muruku, a fried savory treat that we enjoy eating. 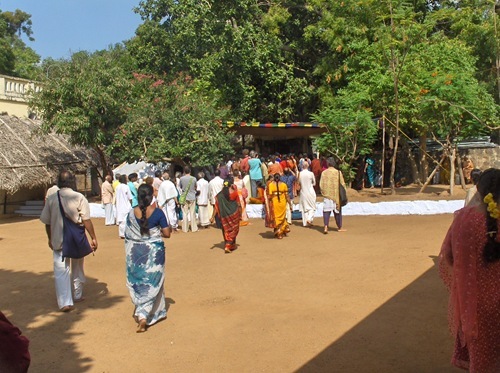 After the decoration and puja for Nandi is over, everybody heads to Laxshmi. Now a puja is underway here. 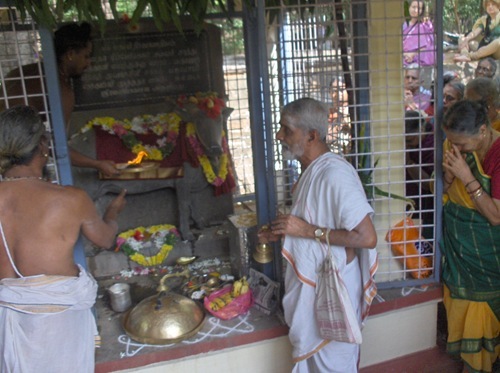 Near Laxshmi’s samadhi a photo of Sri Ramana and Laxshmi has been set out. 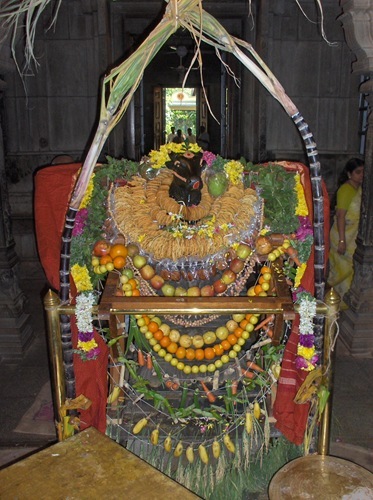 It is included in this puja. 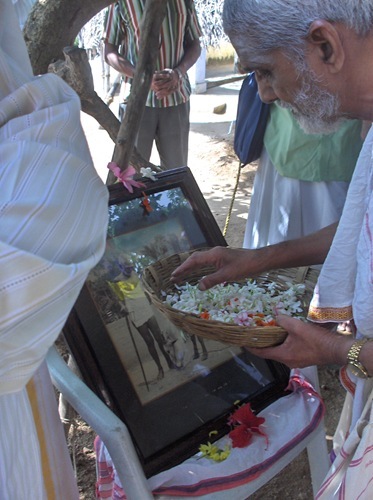 First they will salute Laxshmi, then Sri Ramana. 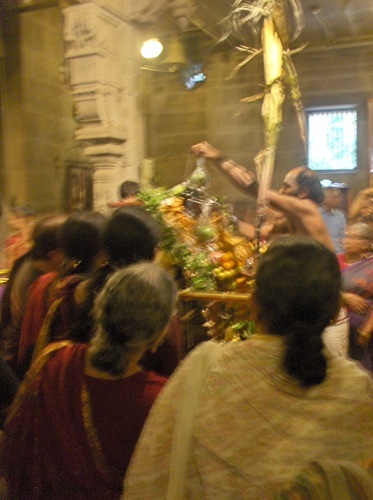 Laxshmi receives a fire offering. 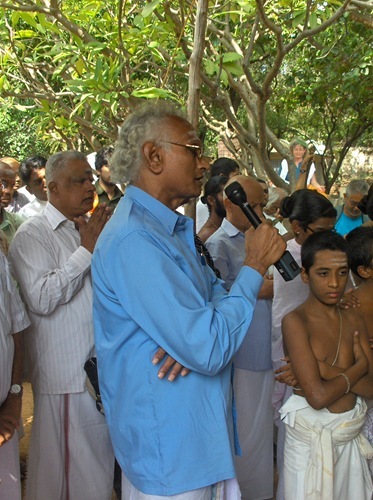 A man with a microphone sings a Tamil devotional song to Laxshmi. A western woman sits nearby, in blissful meditation. 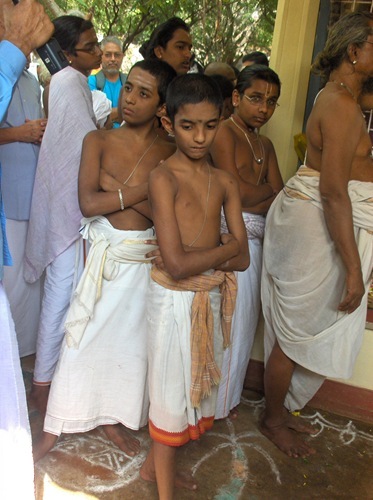 These boys are priests-in-training. 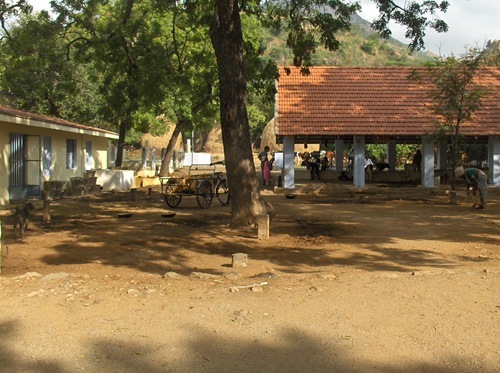 They live at the priest school at Ramanasramam. They look bored to me. Now a woman from the audience starts another Tamil song. She seems so intense in her singing. Naturally, the women are on one side, and the men on the other. 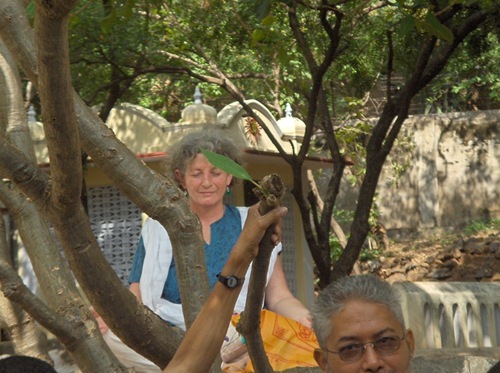 Now camphor is offered to Laxshmi. And then to Ramana, then finally to all present. Now we head over to the cow milking shed. 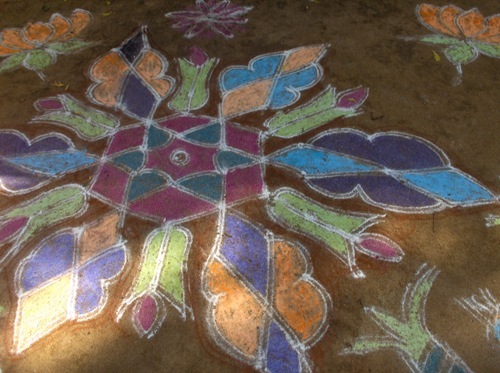 We cross over another beautiful kolam with a colorful design. The milking shed is crowded with people. 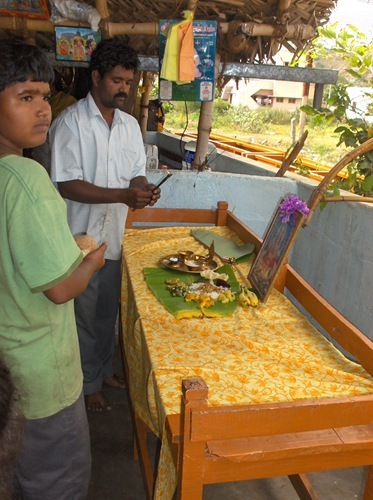 The main activities are on one side of the room, where they are having puja for a few cows. On the other side of the room, more cows stand, waiting for their part in the day’s festivities. A woman gave Carol a banana to feed to this cow. The cow appreciates it. 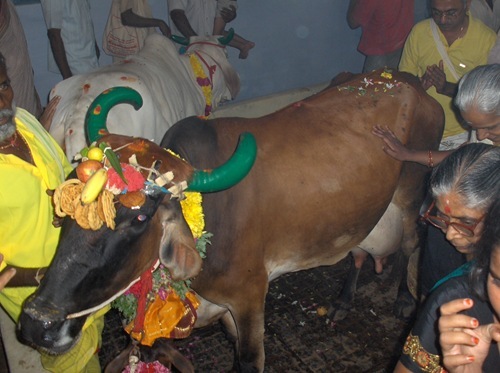 After the camphor is waved at the cows in the main cow puja, it is carried over to the other cows and offered to each of them in turn. We got to walk by the featured cows in the puja. What fine decoration. I think these cows are pretty docile to allow all this. 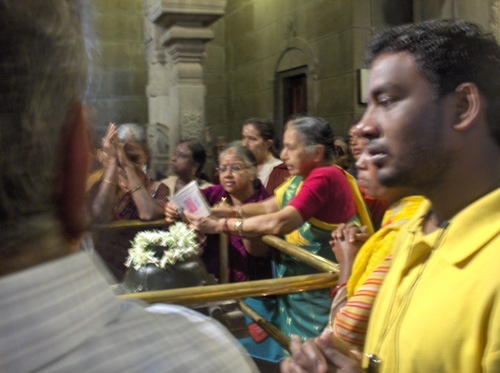 People touch the heads of the cows, then bless themselves with the touch. 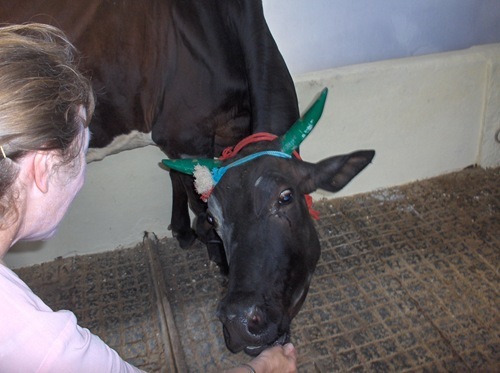 We notice that they touch the other end of the cows too, with the same kind of blessing actions. 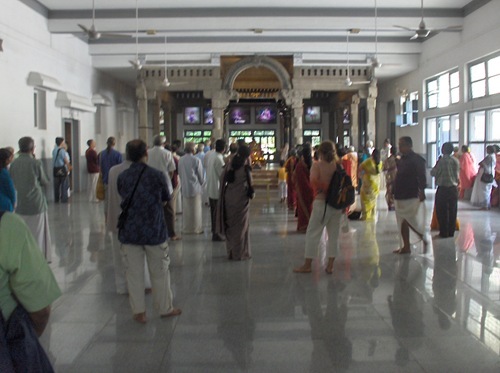 Leaving Ramanasramam, we walk through the ‘New Hall.’ Ramana’s statue has been decorated for the day. 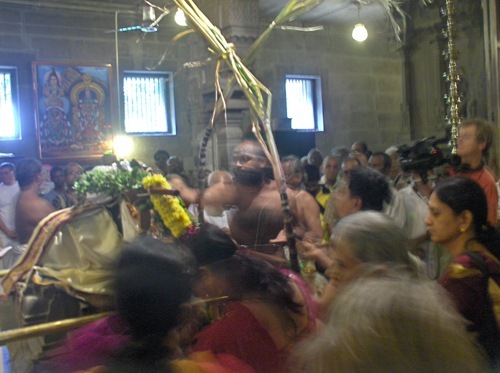 In Mother’s Shrine, all the gods have been specially treated for this day. 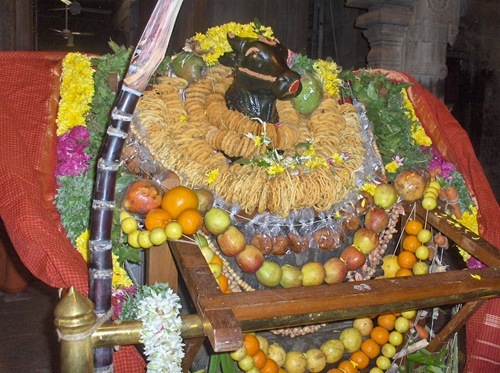 The Nine Planets are decked out in dhotis and flowers. 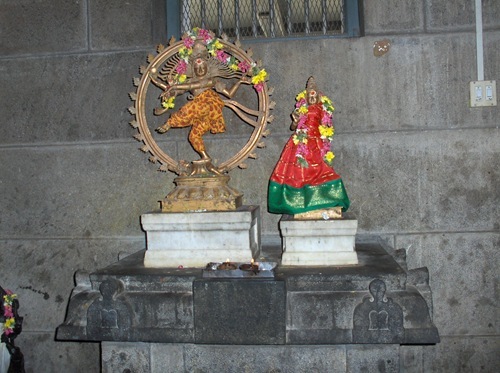 Dancing Siva (Nataraja) and Parvati are in their finest wear, with flower malas for both. 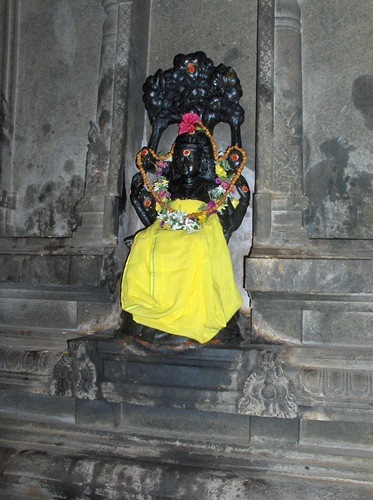 Dakshinamoorthy wears a fine yellow dhoti, flower malas, and fresh marks of turmeric and kum kum. We head home for a while before the next activity. 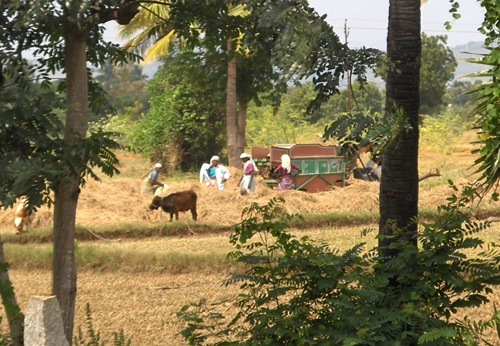 In the field next to our home, we see this group of woman working to bring in a rice crop. 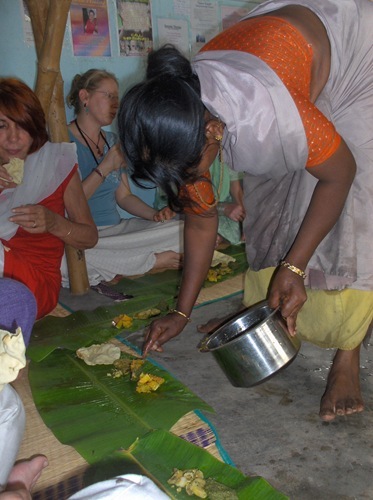 While everybody at Ramanasramam enjoyed the beautiful pujas, these women had to work all day in the field. 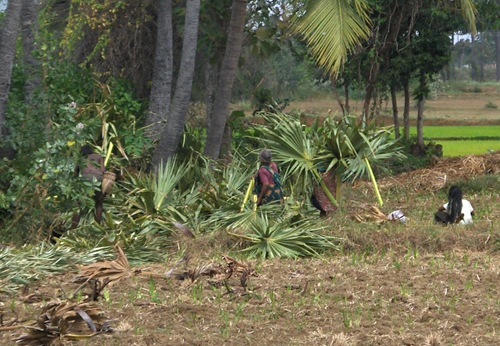 Palm leaves are being harvested in the next field. These will be carefully dried, then used for thatching. 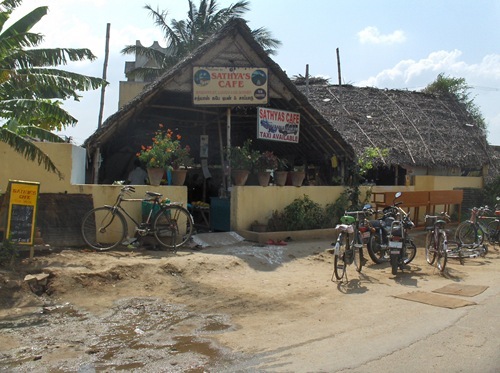 Now we head over to Sathya’s Cafe, on Perimpakkam Road. A special lunch is being offered. This is a ‘benefit’ to help support the abandoned elders that are cared for by Quality of Life Trust in their Elder Project. About 30 people are gathered here for the special meal. 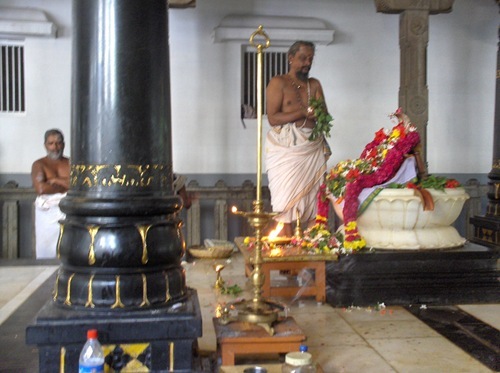 Dhakshinamoorthy starts with a quick puja. 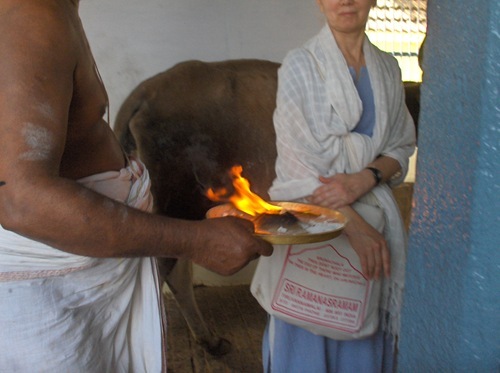 The camphor flame is brought around the room so each guest can be blessed by it. 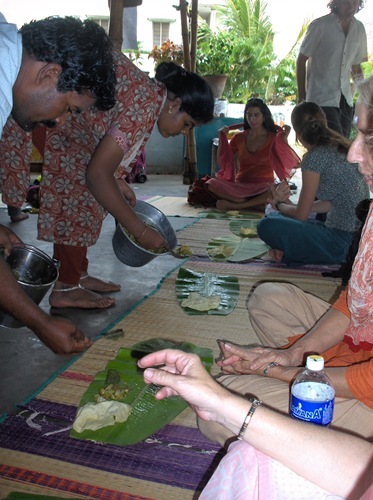 Banana leaves are laid out. And food is served to all. There are maybe eight different dishes served today. All the people eat with relish, enjoying the special holiday meal. 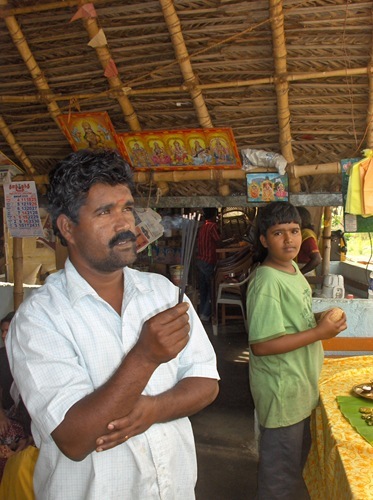 Dhakshinamoorthy names the cafe after his daughter, Sathya. 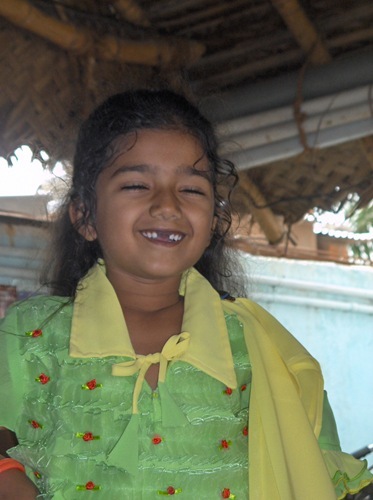 She has just lost her two front teeth. 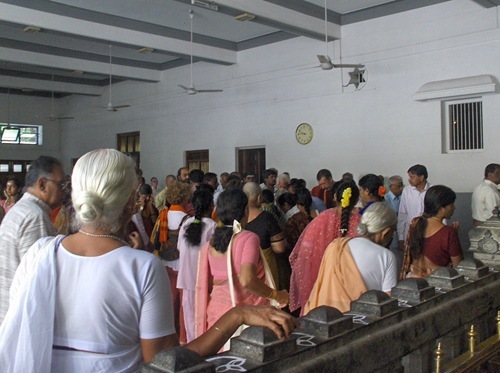 After the meal, Richard spoke a bit about the program for the abandoned elders, and asked for donations. Several thousand rupees were given. This helps for now. More will be needed though in a couple of weeks. There was one primary donor. This worldwide financial crunch has badly affected him and he is unable to give any more. We do not know where the funds will come from to keep Quality of Life Trust able to feel and care for these elders. 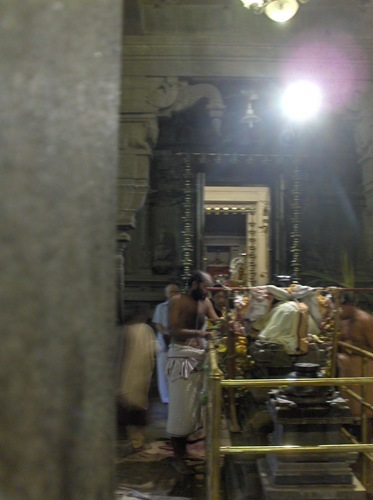 We just have to trust Arunachala that funds will come. After this meal, we headed home. Many activities today. 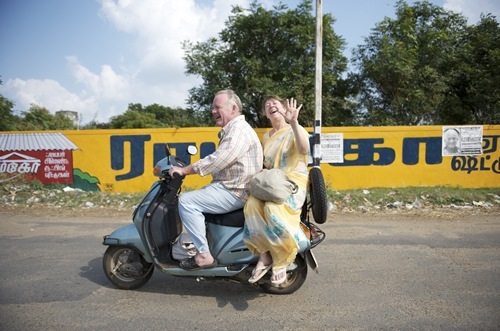 Here we are on the scooter on the way home. 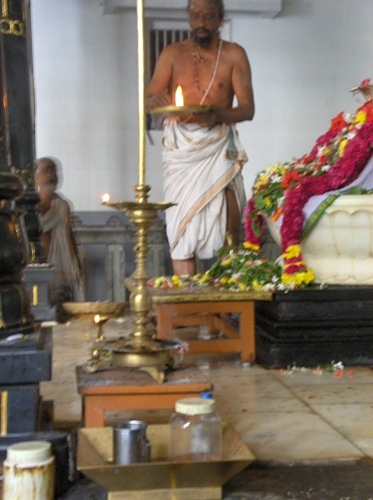 Now we will rest, at home in the embrace of Arunachala. 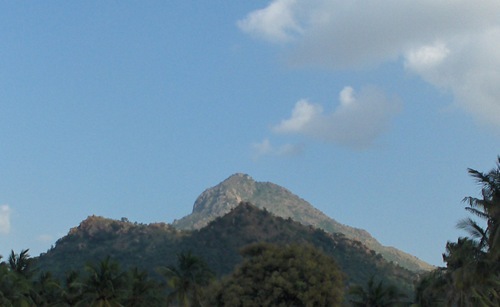 This day started and ended with Arunachala. 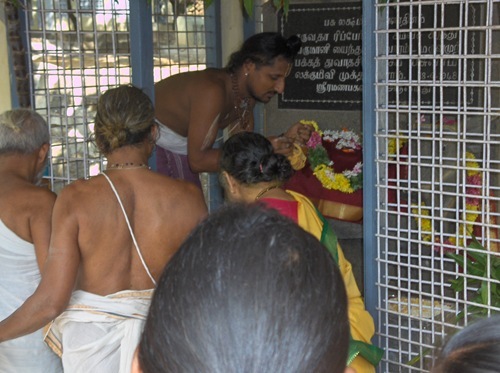 This entry was posted on January 16, 2009 at 9:02 pm and is filed under Arunachala, Spirituality, Tamil Nadu, Temples, Shrines and Ashrams, Tiruvannamalai. You can follow any responses to this entry through the RSS 2.0 feed. You can leave a response, or trackback from your own site.